Before he was General Bonaparte, before he was First Consul, before he was Emperor of the French, even before the French Revolution that made it possible for a Corsican nobody to reach such dizzying heights of power, Napoleon Bonaparte was a wet-behind-the-ears graduate from the École Militaire in Paris. The first Corsican to graduate from the institution, Napoleon completed the program in one year instead of two (forced by a precipitous decline in his finances after the death of his father), so he was just 18 years old when he received his first commission as second lieutenant in the La Fère regiment in October 1785. Madame du Colombier often foretold that [Napoleon] would be a distinguished man. The death of this lady happened about the time of the breaking out of the Revolution: it was an event in which she took great interest, and in her last moments was heard to say that if no misfortune befell young Napoleon, he would infallibly play a distinguished part in the events of the time. The Emperor never spoke of Madame du Colombier but with expressions of the tenderest gratitude; and he did not hesitate to acknowledge, that the valuable introductions and superior rank in society which she procured for him had great influence over his destiny. Napoleon moved on from Valence, following his career star. Caroline married Monsieur Gamparet de Bressieux, a much older former army captain, in 1792 when General Bonaparte was on his Egyptian campaign. They stayed in touch, corresponding occasionally over the years. In 1804, now Emperor Napoleon I replied warmly to a letter from Caroline de Bressieux, offering to help her brother and herself. Shortly thereafter he appointed her lady in waiting to Madame Mère, his mother Letizia Bonaparte. Madame Junot, the Duchesse D’Abrantès, described Madame de Bressieux at court after her appointment as Letizia’s lady in waiting. She was both witty and good and her manners were at once gentle and agreeable. I can very well understand the Emperor going to gather cherries with her at six o’clock in the morning merely to talk to her and with no less worthy motive. A thing that struck me the first time I saw her was the interest she seemed to take in the Emperor’s most trifling acts. She kept her eyes fixed upon him with an attention that could only come from the heart. And that was a decade after their youthful romance had passed and they had married other people. One day, when Napoleon, his mother and Caroline were all together, he asked her who owned the Basseaux estate where they had spent their summer of love together. Caroline replied that her sister and brother-in-law lived there now. The Emperor expressed a desire to grant them any wish, in honor of his fond memories of the estate. Caroline declined in their name, assuring him that those happy memories were gift enough. He said no more about it, but a few weeks later he presented Caroline with a token of his appreciation for all Basseaux had meant to him. 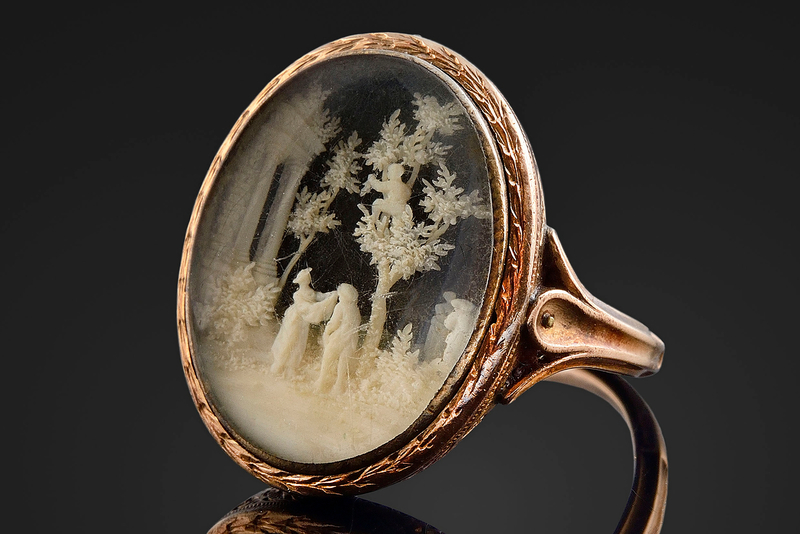 It was a ring, a seemingly modest one, made of gilded bronze with a central bezel containing a miniature carved country scene under a glass cover. 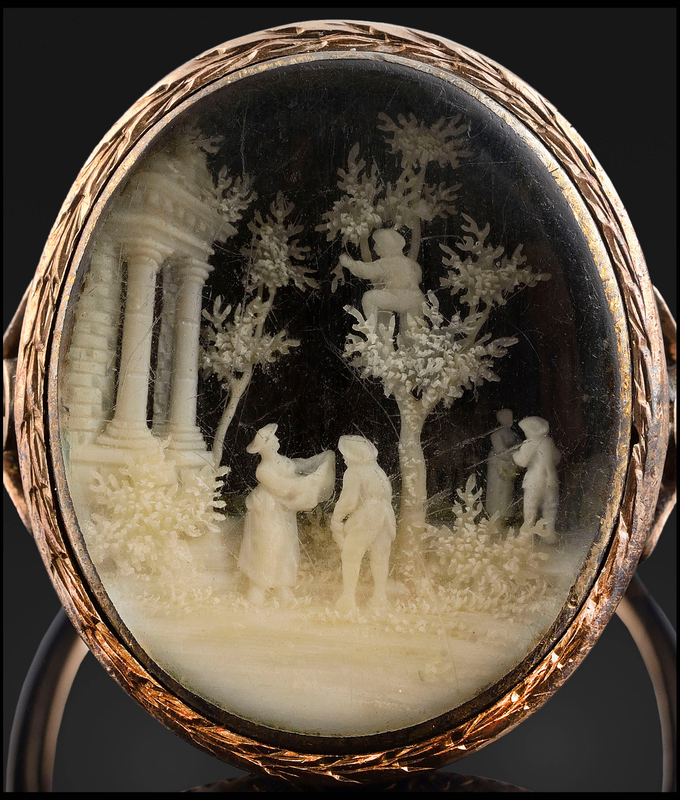 It was the carving, made of marine ivory, that made this ring a masterpiece. In exquisite detail, the scene depicted a group of country folk collecting fruit from trees under the shadow of an ancient temple. The fruits were, of course, cherries. The ring stayed in Caroline’s family, a treasured heirloom, for more than 200 years. On Sunday, March 26th, the heirs sold this beautiful symbol of Napoleon before he was THE Napoleon at auction in Paris. The pre-sale estimate was 15,000-20,000 € ($16,000-21,000). It sold for 36,250 € ($38,580), a tribute to its artistry, yes, but more so the poignant sweetness of its history. This entry was posted on Monday, April 17th, 2017 at 11:36 PM	and is filed under Modern(ish). You can follow any responses to this entry through the RSS 2.0 feed. You can skip to the end and leave a response. Pinging is currently not allowed. What an incredible little story told with the gift of brevity – which is always, as Shakespeare so aptly pronounced, “the Soul of Wit”. Your very brief essay is truly like a wonderful Poem– so Bravo and Bravo Encore. One can so clearly see, in the mind’s eye, the participating actors as they met, fell in Love and went through all the ancient rituals of all that giving away one’s Heart to another entails. And yet the long arm of Destiny interceded and prevented them from remaining together. You have so very tenderly painted a series of colorful vignettes that stretch across decades of time all of which, in the end, were summed up and encapsulated within the confines of a supremely delicate and exquisite little ring which as you state stayed in Caroline’s family for 200 years. Your words reminded me of the famous final scene in Orson Welles immortal Masterpiece, “Citizen Kane”, in which the dying old man, whispers with his final, faint breath, that sole mysterious name: “Rosebud” and then expires. Perhaps we fragile Mortals, regardless of how high we rise in the world, all carry in the core of our Hearts some image, some face, some name, something that despite all our worldly victories, in the end is what we most treasure and recall with deepest fondness, even with our last breath. 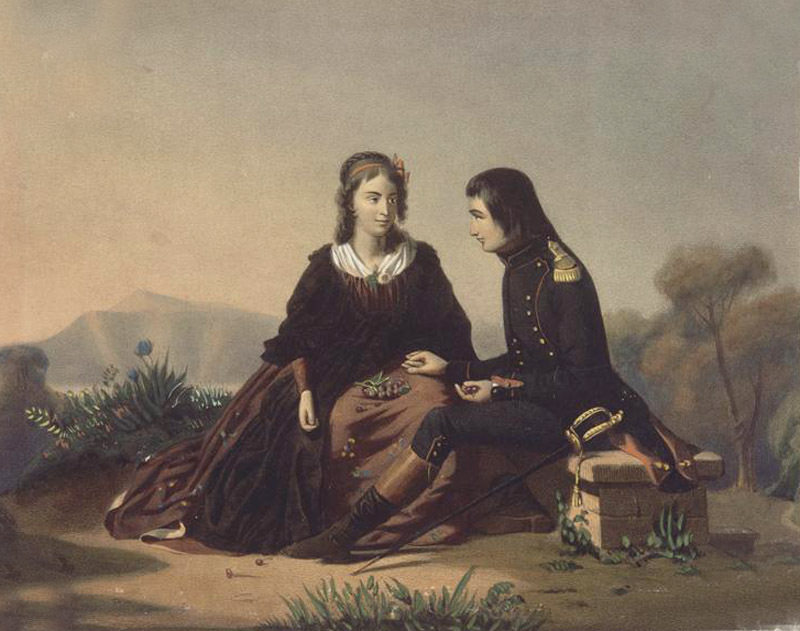 Perhaps for Napoleon that image was Caroline and for Caroline it was Napoleon. In “Ode on a Grecian Urn” the poem written by the immortal English Romantic poet John Keats in May 1819 and published anonymously in 1820 we encounter those amazingly memorable final words that are both bitter sweet and yet never cease to pull at our Hearts just like the story so beautifully told by you, of Napoleon’s first Love. This is truly one of the very most memorable of all your many entries on The History Blog. One knows even as he reads, “Napoleon’s first love captured in a ring” that the imagery you have so deftly and lovingly created with such tender brush strokes, will remain in the center of one’s Heart and imagination, Forever. For that we must all say: Thank you. I wonder why the family sold it…..
“One Ring to capture ’em all and make ’em see” ..Indeed, ‘eating cherries together’, might be a nice way of putting ‘it’, even if the only thing to have been ‘captured’ here, might be the ring itself – I have to agree: Truly a splendid text – ‘like a wonderful Poem’, if only Madame du Colombier had cut his throat! As far as the ring itself is concerned, it appears to be very(!) elegantly crafted, and real gold that(!) thin would possibly not have technically worked in the first place (gold being softer than gilded bronze). Also, may I ask what ‘marine ivory’ is ? Is it walrus tusk, coral, material from whaling, mammoth tusks from the bottom of the ocean ? With inverted colors, however, the ivory or coral piece, looks almost like a little B/W photography. Great story and excellent writing and pics as always. The gavel price seems like a deal for this ring given the provenance and story behind it. “A man such as I am cares nothing for the lives of a million men”. Bonaparte. I believe he was as good as his word.